Concrete makes stout long-lasting steps. The look, however, can leave something to be desired. One way to dress up concrete steps without sacrificing their utility is with thin brick pavers. 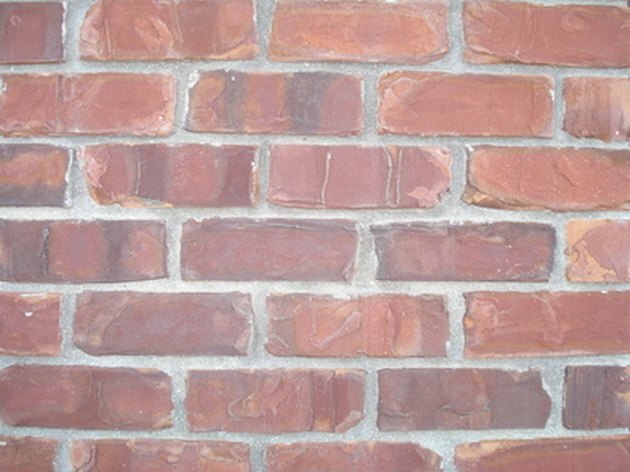 Brick pavers, or brick tiles, come in a variety of colors and styles, making it easy to find a brick that suits your home's architectural styles. 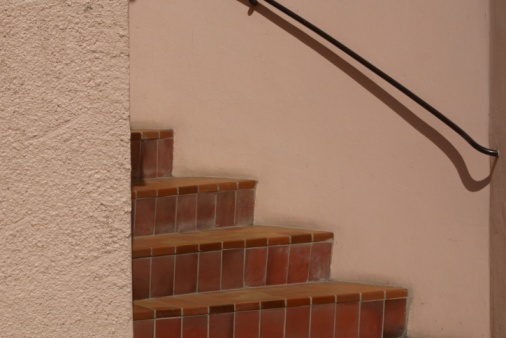 Before covering the steps, evaluate them to make sure their foundation is stable. Shifting concrete steps can cause the paver's mortar to crack and crumble. You can give your concrete steps a brick look. Measure the steps. Measure the tops, or treads, of the steps from front to back and side to side. Measure the risers, or fronts of the steps between treads, from top to bottom and side to side. Multiply the width by the depth of the tread to find its area. Multiply the area by the number of treads to find the total area of your treads. Multiply the width by the height of the riser to find its area. Multiply the area by the number of risers to find the total area of your risers. Add the two totals together. Order enough brick pavers to cover the entire area. Start with the top, or tread, of the top step and work from one back corner. Apply a thin coat of mortar mixed to the manufacturer's recommendations. Use a notched mortar trowel to get an even coat. Work in a small section to prevent mortar drying before you lay the brick. Set the first paver in place against the back of the top step and flush with the outside edge of the step. Use a ¼ inch tile spacer set against the first paver to determine the placement for the second paver. Work the paver into the mortar with a small side to side motion. Square it up so that the space between pavers is even and set the spacer against its edge. Place the next paver against the spacer, keeping the line between the two bricks as even as possible. Work the paver into the mortar as with the first. Repeat the process until the opposite side of the step is reached. Pavers can be run parallel or perpendicular to the steps. Use whole pavers wherever possible. Cut a piece of paver to fit the left over space at the end of the step. Use an abrasive blade on a circular saw to score the paver to a depth of ¼ inch. Tap along this line with a hammer and mason's chisel to break the paver. Space the next line of pavers with the spacer and continue until the step is covered. Use the cutoff piece from the last row to start the second row. This spaces the bricks so that the grout lines will be staggered. Apply a coat of mortar to the face of the riser of the step. The riser is the vertical face between the treads, or tops of the steps. Apply brick in the same manner as before. Use whole pavers whenever possible and make sure to work the paver into the mortar. Continue applying mortar and brick pavers until the faces of the steps are covered. Use clear water and a brick sponge to clean off any excess mortar on the face of the pavers as you work to prevent it from drying. Mix a small batch of grout. Spread the grout across the surface of the steps using a foam-faced grout trowel to work the grout into the lines between pavers. Mix more as needed in small batches to prevent the grout from drying out. Wet the bricks and clean as much grout as possible from the paver faces using the brick sponge. Allow the grout to dry thoroughly and clean with a solution of brick cleaner available at your local hardware store. Can You Install Pavers on Top of Existing Concrete Steps?